It’s the final week of the One Room Challenge. 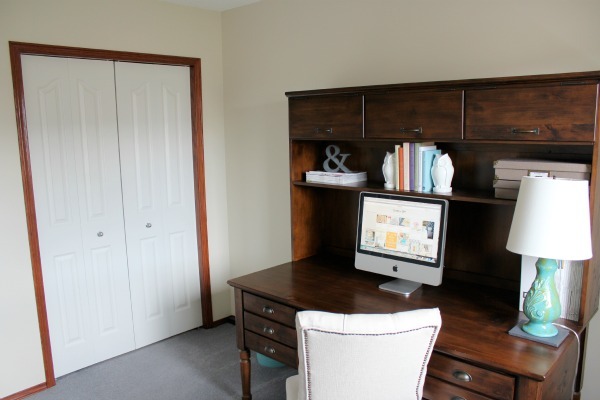 Come check out my office makeover! On week one of the challenge, I started out with an office that lacked personality and definitely needed some attention in the organizing department. Because most of my time and attention is usually spent on client projects, I didn’t have time to transform the space from head to toe, but I’m thrilled with how everything is looking in a short period of time. Let’s take a look, shall we? Last week I started an art project using an old canvas I found kicking around in our storage room. 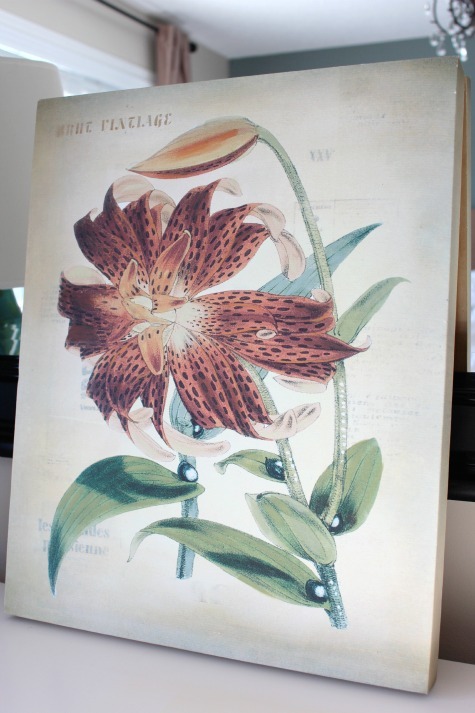 It now hangs on the wall beside my desk, and I love the subtle color it brings to the space. My husband titled it “Foggy Lake” and, although it may not be a true work of art, I’m happy with how it turned out considering the little time (and basically no money) I spent on it. 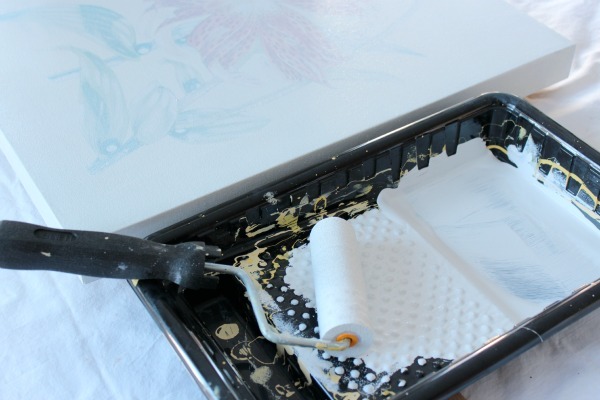 If you have some leftover paint and an old canvas, I encourage you to try this project. Be sure to prime over what’s there first to make sure you get good coverage. 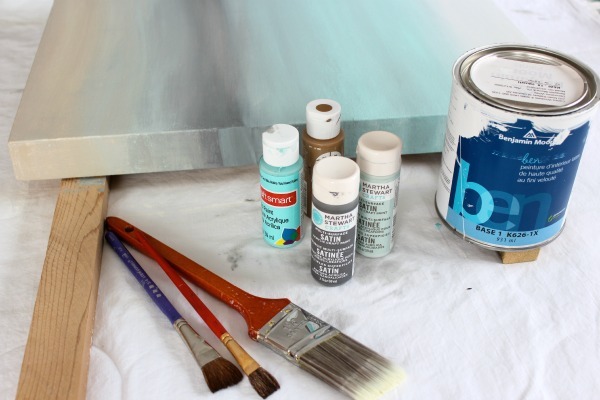 I started with a natural linen paint color at the bottom of the canvas and worked my way up with a light blue-green, dark grey, light turquoise, and finally, white. To blend the colors, I simply dipped my brush in water, patted it on a paper towel and worked them together moving the paint brush back and forth (slightly overlapping). It’s really hard to mess it up, but make sure you don’t overwork the colors (you don’t want them to look muddy). If you do, just go back with more paint. After it dried a bit, I went back and touched up a few areas with a watered-down brush and a bit more paint. 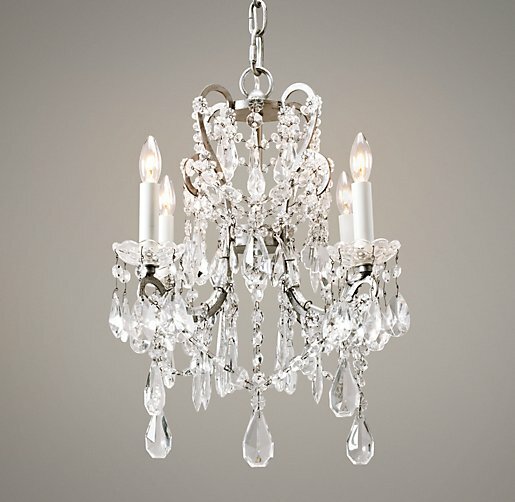 Unfortunately, I’m not able to show you the new crystal chandelier I selected for my office since it hasn’t arrived yet. I also still want to add a roman blind to the window (see that update here), a storage cabinet on the wall opposite my desk, and a few more art pieces to the space. Eventually we’ll be replacing the flooring and trim work, but that’s part of a project involving the whole second floor, and I’m not ready to open that can of worms just yet! 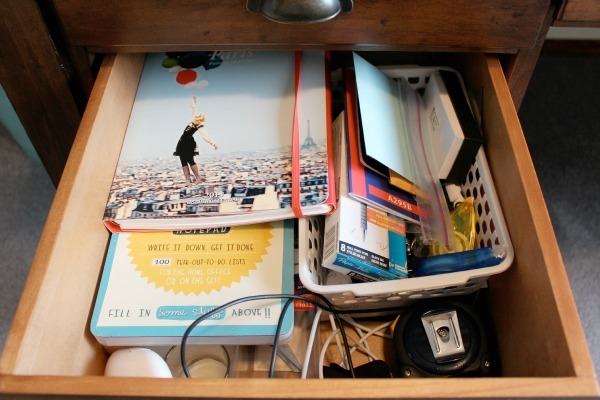 See this drawer organizing project HERE. See this office update HERE. 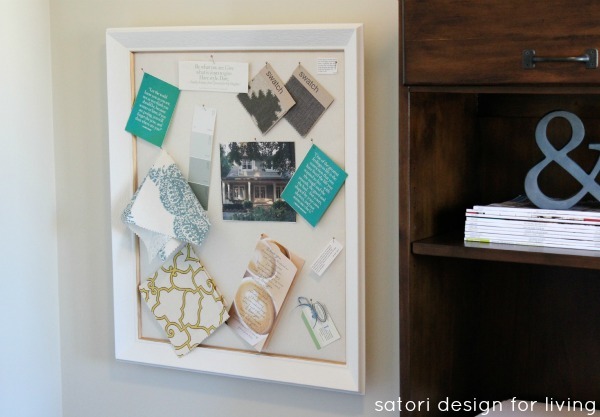 See this pinboard project HERE. 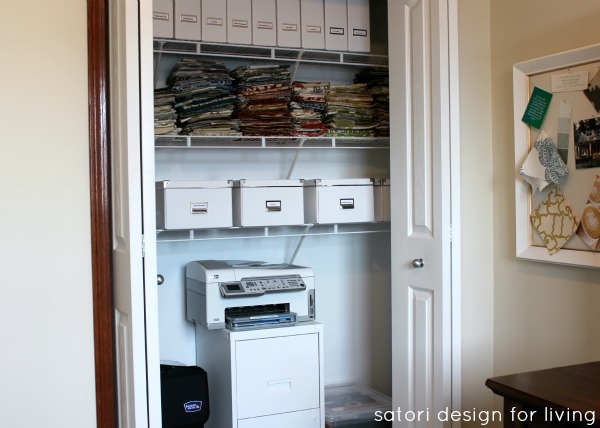 See this organized office closet HERE. I’d say overall the One Room Challenge was a success. I would definitely participate again! Make sure you check out the other One Room Challenge reveals, and look for more of my office updates in the coming weeks. Thanks for following along. I’ve enjoyed all the new visitors and reading the lovely comments! Love it! That must feel so good Shauna! I have a project in every room that needs to get done but i’m suddenly swapped with new design clients and 2 vacant stagings so it’s going to have to wait -Again! I still have a ways to go, but it feels good to be so much closer. It really takes doing something like this challenge to put some of my own projects at the top of my priorities list. Hope you can find some time to finish at least a few of your own! I love the new art work additions! And I love a organized closet! You must be so happy to sit down and work now! It’s much better, but I can’t wait to add the final elements so I can move onto other areas of my home that are crying out for some TLC. I know you can relate! I always learn something new when I visit, and today it was the ingenious idea of painting over an existing canvas! I don’t know why that has never occurred to me before. Decoupaging, sure, but for some reason I never connected the painting dots!! 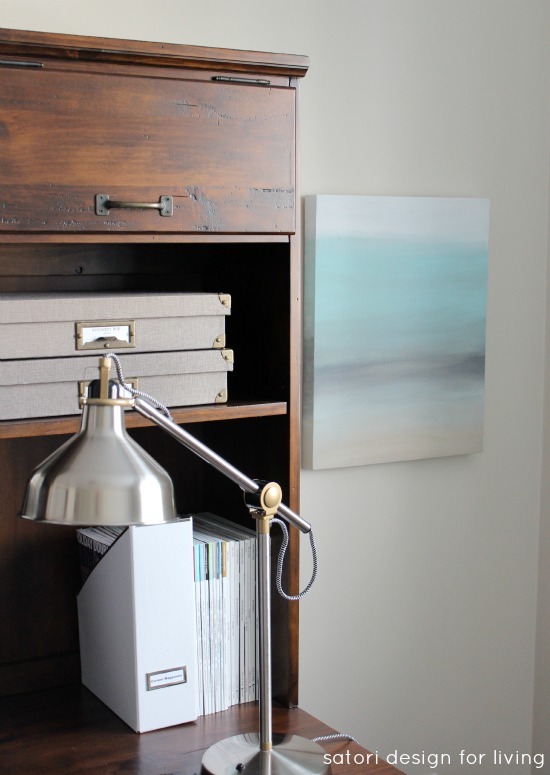 I really like the way your ‘new’ canvas turned out – the colours are awesome as is your office makeover. 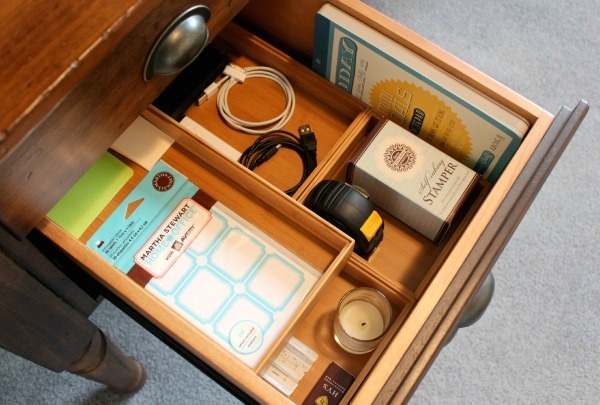 I’m still loving the look and function of your desk drawer organizers!!! Such an easy project! I have a few more kicking around that I’m going to tackle. Thanks for following along! It’s going to be perfect…it’s already beautiful!! 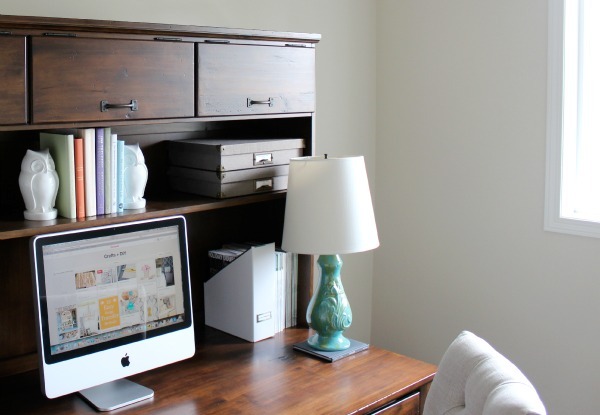 You tackled one thing I didn’t during my home office makeover…organization. For that you should be happy…well done! I’ll be checking in for updates! It’s so worth taking the time to organize. No more shuffling around in my desk looking for the stapler or a cord- you know how it goes. Off to check out your space! 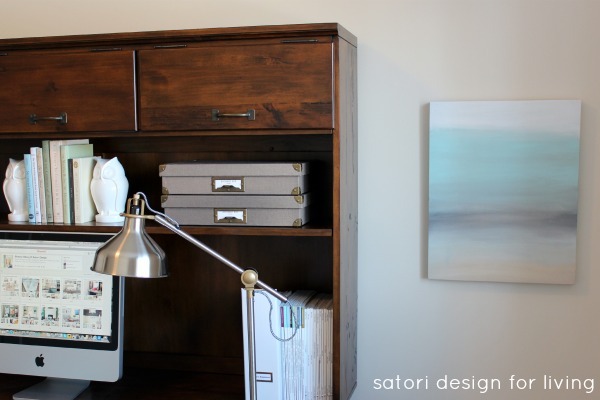 I’m so envious of your beautiful and organized office Shauna!! I love your abstract, and know from trying they’re harder than they look! Your chandelier will be stunning! Enjoy! Thanks Pam! Your bedroom is gorgeous, and like I said, I’m going to use something similar to your Ikea hack project to finish the wall off opposite my desk. Can’t wait to follow your next round of ORC. 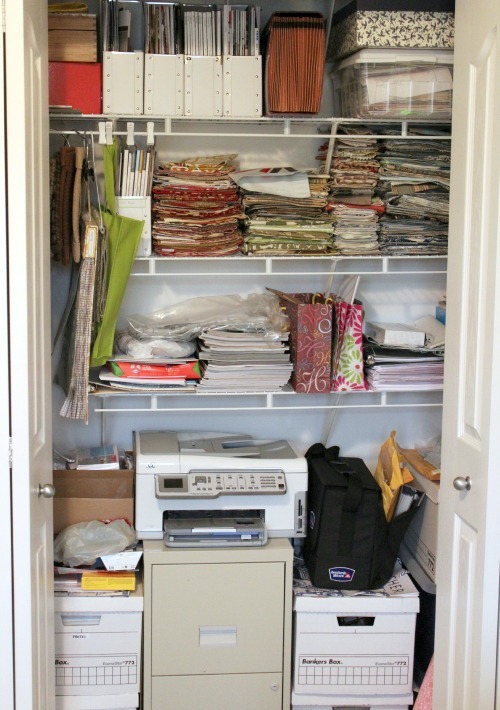 Great job on your office organizing- a tidy closet always makes me happy. I’ve got a few I need to tackle myself! My goodness, it is so organized! Can you come to my house?!! Glad I’m not the only one that can’t seem to check things off the list. I joined the ORC for the same reason as you. 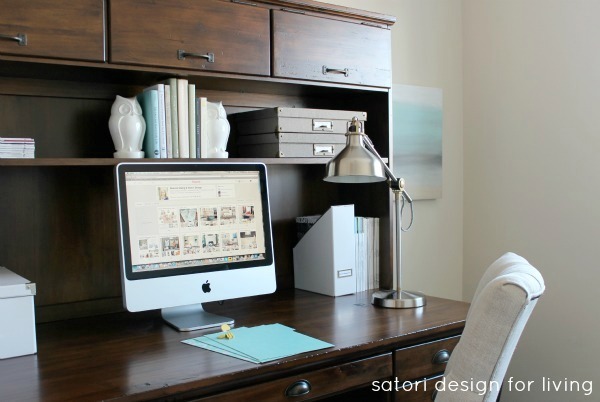 ;) Love how your office turned out and I know how great it must feel to have the closet organized…as I’m sitting in my tornado of an office, I hope to have a space that organized too. So well organized! I could definitely get some work done here!! This came out great, Shauna. I am so happy you jumped in. I wish my office space looked like this one. The artwork that you did was brilliant. I will be curious to read if you get more work done in a lovely space? I would guess so. It’s definitely nice to have something to look at other than bare walls. The inspiration board seems to be doing it’s job! Thanks again for inviting me to join this series. I have my calendar marked for April. Great job! You have me thinking about some organizing I need to do around here! Thanks for the art tutorial – definitely something that I’d like to try because I LOVE the piece that you created! Also love the pinboard – your office sure looks done to me – it’s great!! Looks great! I’m hoping to use a lot of your ideas when I do my office! Though your fabulous chandy hasn’t come yet, I still think you did great on this space Shauna! The “foggy lake” is truly beautiful and I know your quite content with you’ve done for this space!!! 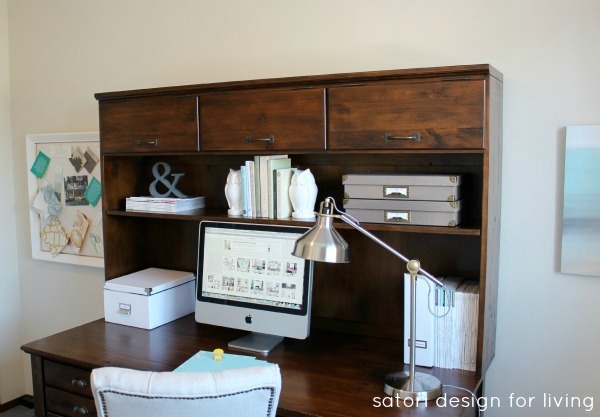 Love it’s simplicity and serene feel, just what an office should be! CHEERS! I bet you are loving your new space! That closet is amazing and your chandy is going to make the room just amazing! What a beautiful office! I love the white & gold pinboard. Just downloaded your “Conquer the Paper Trail” ebook and am looking forward to reading it! I also have a small office area, which I share with the husband because he works from home. So I take the smaller wall space, but you have inspired me to make it my own and brighten it up a bit. thanks for inspiration and great ideas. Love that art! I really like all the abstract landscapes that I’m seeing now, they’re beautiful and easy. That desk is great; I love the hardware and the color. Wow, I missed this post – LOVE your office! and that desk! and that chandelier!!!! Great job on the revamp!